I believe that most of us have a writer that acts as a comfort. A writer whose work we choose to revisit once we feel that nothing is as it should be. This is a period which has taken a significant toll on me on a number of levels. Kazuo Ishiguro and his tender, sensitive, hopeful writing felt like a suitable choice. It goes without saying that this collection is one of my favourite creations by this master of Literature. Crooner: In Venice, a musician from a country of the former Iron Curtain meets an American singer. A story of memories, aspirations, and disappointments. Malvern Hills: A young, aspiring musician meets a middle-aged couple of professional musicians while working in his sister’s inn. A couple that is obviously miss-matched but united in their love for music in an extremely ‘’picturesque’’ story. 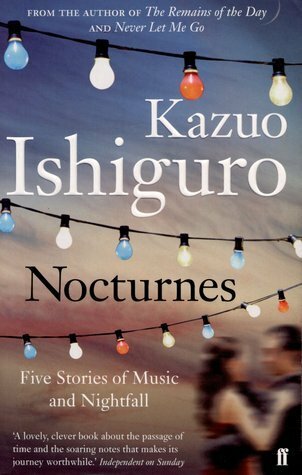 Nocturne: An underachieving musician is advised to consider a plastic surgery to become more handsome…And he accepts. He meets a famous woman whose nocturnal escapades in their hotel provide a chance for contemplation and a possible moment of realization regarding fame and vanity. Cellists: A young Hungarian musician meets a beautiful cellist. But nothing is as it seems. This was my favourite story in the collection, its ending almost brought tears to my eyes. Every time I see those five stars I am ever so happy. Super glad you enjoyed this one, Amalia! Your reviews are always inspiring. This is one of the best collections I’ve ever read and probably my favourite book by Ishiguro, just brilliant.